The godfather of the alt-right appeared at the Oxford Union last week. Suddenly swastikas started appearing on the town's walls. Not four days after former Donald Trump advisor and general alt-right benefactor Steve Bannon spoke at an Oxford Union event, swastikas showed up sprayed all over a local community centre. Oxford City Council quickly came in to remove the offensive signs, but the link between the two events did not go by unnoticed. Local councillor Shaista Aziz shared the graffiti on Twitter and called for an investigation. Last month posters were defaced in the centre of town with Holocaust denying slogans. Bannon took part in a debate at the renowned Oxford debating society on Friday, in spite of large protests outside the building. Not far from the antifascist campaigners Bannon’s supporters stood by doing nazi salutes. And yet, both the Oxford Union, as well as some of the British punditry have come out in defence of Bannon’s right to freedom of speech and the benefits of challenging or “airing out” his views in public. I can’t help but find it fascinating that people who one week scream their lungs out about the duty one has to wear a red poppy and #remember, are ready to fight for Bannon’s right to speak the next. Some might think that just because Britain beat the German army during WWII it means it also beat fascism. But fascism isn’t Germany. Fascism isn’t culture or country specific. Fascism is a social dynamic that develops under the right economic conditions, and is turned into state governance by a political apparatus. All the bile and bigotry contained inside fascism lies more or less dormant in most societies until it is asleep no more. We should celebrate the fact that humanity banished authoritarian, ultra-conservatve, white supremacy from state power in 1945 (at least as far as Europe is concerned). But we should not be as complacent as to think that fascism is thus over, passé, and that it can’t, rather easily, rise back to power – if not in Germany, or Europe, surely somewhere else. Anyone looking at Bannon and believe that his opinions are hygienic enough to be aired in public, or even some kind of polemic words of wisdom, should take a long hard look at their own held principles and beliefs. We normalise, legitimise and ultimately allow for the propagation of these revolting ideas every time we give a bigot like Bannon a stage. Just look at Brazil’s new president elect, Jair Bolsonaro. When journalists and commentators got asked what they thought of Bolsonaro’s astronomic and rapid rise to power, many said they never thought it would happen. They’d give him airtime because it was “funny” to see such an unhinged politician, a nobody from the backbenches no less, aspire to be the country’s president. A year later, here we are. With an openly racist, homophobic, misogynist taking over Brasilia on January 1. 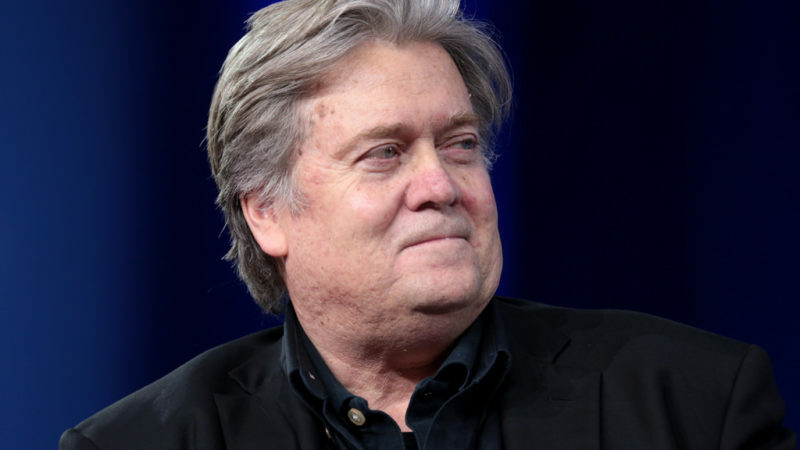 The experience in Oxford shows that even in an academic, mostly liberal town, despite there being plenty of opposition at the door – Bannon’s presence immediately emboldened extreme racism and anti-Semitism. To continue allowing these people to speak is a fighting against the principles we want to build a fair and just society on. Anyone rejecting that notion must go away and think about which side of history they really want to stand on.